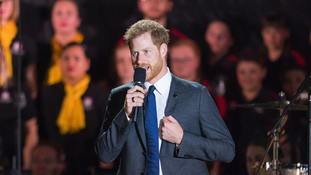 The Duke of Sussex has opened the Invictus Games in Sydney – with more than 500 competitors taking part in 13 sports in the Australian city. It is the fourth Games to be held, following similar events in London, Orlando and Toronto. Harry, accompanied by three athletes, a Games ambassador and Australian Prime Minister Scott Morrison, climbed the landmark Sydney Harbour Bridge to raise the Invictus flag on the eve of the Games. At the opening ceremony, the duke said: “Invictus has become about the example of service and dedication our competitors have provided to the world. A regular Paralympic-style championship for injured servicemen and women was an idea begging to be stolen, Harry said when he originally launched the Invictus Games. He played an instrumental role in bringing the Games to the UK in 2014, when 300 competitors from 13 countries took part in the inaugural competition in London. A trip to the Warrior Games in Colorado a year earlier had been the inspiration as Harry saw first hand how sport helped inspire recovery and support rehabilitation of wounded troops. Speaking at the launch of the Games in March 2014, he said: “I have witnessed first hand how the power of sport can positively impact the lives of wounded, injured and sick servicemen and women in their journey of recovery. The Games went on to be held in Orlando in 2016 – with the Queen comically dismissing a challenge from the Obamas in the build-up to the event. More than 550 competitors from 17 nations competed in 12 sports in 2017’s Games in Toronto, which was also notable as being the venue for the first official outing of Harry and his now wife, Meghan. The couple were seen laughing and smiling as they took in the wheelchair tennis, and he gave the duchess a kiss on the cheek during the closing ceremony at the Air Canada Centre. The duke’s strength of feeling for the forces follows his 10-year full-time military career, during which he went on two tours of duty to Afghanistan and qualified as an Apache Aircraft Commander. He finished his service after a secondment with the Australian Defence Force in May 2015.